Back in 2012, Brett questioned the right of a governing body to essentially block Team USA athletes from being able to promote their own brand if they are sponsored by companies that are not “approved” by said governing body. 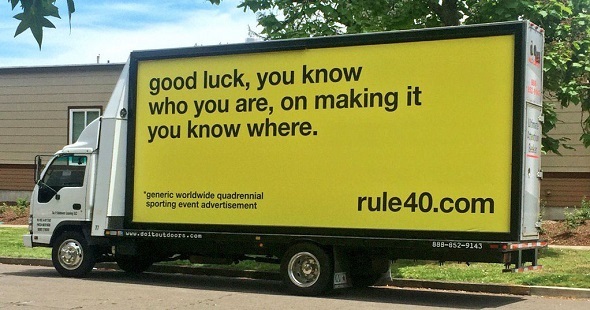 It is called Rule 40, which aims to control the image of an Olympian for advertising purposes during the Olympic Games. It’s so restrictive that only governing bodies and selected sponsors (i.e. Nike, Coca-Cola, Hershey, and other big-named companies) are allowed to use the phrases of “Olympic Games”, “Olympian” or “#Rio2016” in their advertisements – hence the funny phrasing on the van in the image above. Unfortunately, that change has not occurred yet and athletes AND small companies are still protesting. After all, if you spend so much money to help out these athletes with their training and competition during non-Olympic years, why can’t you show your pride in them? One of the biggest protesting voices is Oiselle – a small woman’s apparel company that sponsors Yale alumna Kate Grace. Oiselle is so proud of Grace’s accomplishments from the last few years, especially when she represented the USA at the World Relays (where she helped set a new world record in the 4x1500m relay) and qualified for her first Olympic Games this summer. So proud that they want to show it by wishing Grace congratulations on social media. But both times Oiselle did that, they got contacted by the U.S. Olympic Committee to take down their social media content that congratulated Grace as they said it violated Rule 40 (read it from Oiselle’s blog). The story blew up and was covered by many media outlets, including YahooNews and the Washington Post. And since Oiselle cannot promote Grace in any way from the time period of July 27th to August 24th, Oiselle has asked the fans to help them out and protest Rule 40 by reaching out to the Olympians to show your support. Good thing HepsTrack is a fan-based website. We support all of our Olympians – regardless of who their sponsors are OR which nation they are representing. So HepsNation, go onto social media and bombard our athletes with supportive messages. We have their social media contact info or close equivalent below. You’re always welcome to take an extra step and show your support AGAINST Rule 40 – Oiselle has some suggestions as to how (or check out here for more general information). This entry was posted on Wednesday, July 27th, 2016 at 5:50 pm. It is filed under Olympics, Spotlight. You can follow any responses to this entry through the RSS 2.0 feed.